Trailhead has been instrumental in my career trajectory. 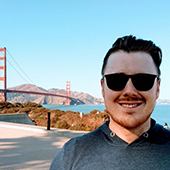 I work in a very rapid environment and I was able to go from recent university grad to Senior Technical Consultant in just over two years thanks to Trailhead. I first heard about Salesforce at my first job out of university. I started working at Davanti Consulting in 2015 and needed to quickly get familiar with Salesforce. Coming from a computer science background, I had a lot of technical experience, but nothing Salesforce-specific. I was nervous about working on a platform that I had no experience with, but thankfully, I found Trailhead to be a really useful tool to train myself. I spent the weeks prior to starting my job going through Trailhead to get up to speed with the basics of Salesforce. Once I started at the company I was prepared to dive deeper with the experts there and learn even more. 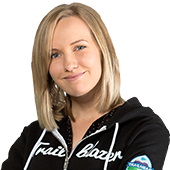 How did Trailhead jumpstart your career? I was able to go from recent university grad to Senior Technical Consultant in just over two years. Trailhead has been instrumental in my career trajectory. I work in a very rapid environment, which often requires me to gain mastery of a topic quickly. 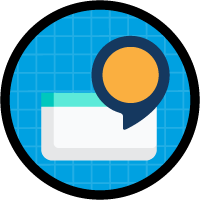 Trailhead helps me learn new concepts and functionalities that I can use to build prototypes, and help customers achieve their goals. Since I'm always working with multiple customers on a variety of projects, I need knowledge and experience across a lot of Salesforce capabilities. 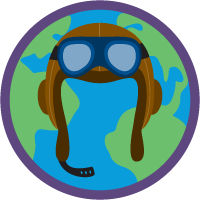 Using Trailhead prior to starting a project helps me make sure I not only know the best practices but get some hands-on experience too. 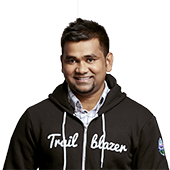 Trailhead gives me the confidence to tackle all kinds of Salesforce projects. How has Trailhead helped your company? It was when I took on a senior role that I started looking at Trailhead differently, seeing how it could be used to educate not just me but the whole team. I started creating custom pathways of Trailhead that would help individuals skill up quickly and achieve their longer-term career goals. This was particularly useful for graduates, people from non-technical or non-Salesforce backgrounds or people starting a new project who needed a refresher on a particular product. Trailhead gave them an extra depth of knowledge to have informed conversations with clients. Then trailmixes came out, and made this process much easier and faster! What other things do you do with trailmixes? Well, besides making trailmixes to onboard new hires, we now also create trailmixes for clients, tailoring them quite specifically to the work we’re doing with them. This enables the client to learn how to do simple tasks themselves, like creating reports and dashboards, leaving us the time to help with the more complex implementations. We find this approach improves engagement, because we’re not just telling our clients how powerful the technology is and what it can do for them, we’re showing them. Describe the moment you first realized you were a Salesforce expert. I think being a Salesforce expert is a journey and not a destination. The best part about learning Salesforce is that the technology is constantly evolving and improving in exciting ways. This means continuously learning, exploring new skills and pushing innovation. What would you like to be a subject matter expert in? My academic background was in computer science and machine learning, so I have a keen eye on Einstein. Dreamforce '17 introduced a lot of new features for Einstein and I'm intrigued by myEinstein platform services. The idea that anyone can now create customized predictive apps is a game changer. I'm focussing on learning everything I can about Einstein at the moment, as I would be keen to be a Trailblazer for Einstein in New Zealand and Australia. My dream job would be to run an intrapreneurship incubator within a larger company or be the founder of a startup. Currently, I am trying to learn as much as possible, and gain knowledge from the experienced individuals I work alongside. I love the idea of building an incubator or company and filling it with driven, creative, and inspiring people. It's one thing to love your job in technology, it's an unexpected bonus to also be dunked into an amazingly supportive community. I would never have guessed that a company's user base would be such a lively and supportive force. There is very little competition, besides the healthy kind. Everyone wants to help each other achieve success. I have met so many people over the past few years, and it was great to meet a lot of them in person for the first time at Dreamforce. Being a Trailblazer means constantly being ahead of the crowd. You must be putting in the effort to learn the latest technology, and have the courage to try new things. What excites you about the future of Salesforce? 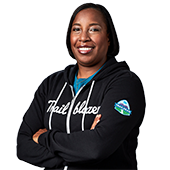 I am really excited about the recent introduction of myTrailhead, and the possibilities of companies being able to customize the Trailhead learning environment with their own material. Start small, try to do a module per week and make to share your successes on social media because other people will congratulate you and cheer you on. People often ask me how I find the time to have earned 245+ Trailhead badges. 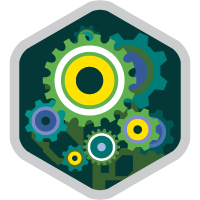 It’s a matter of setting goals, utilizing any spare time and chipping away at it, doing one or two badges a week. I find picking ones relevant to the projects I'm working on is hugely beneficial. This year, I’ve been working a lot on Community Cloud and Service Cloud implementations, so I jump at the chance to do a related badge. It just gives you that extra confidence and credibility when talking to the client. Trailmix you would like to share? 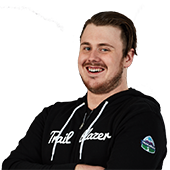 I learned how to build a basic Visualforce page through Trailhead. I always thought it would be super hard.